Small spring azure butterflies like this one are a treat to see on walks in the April woods. This one is probably a male. It lacks the dark border that females have at the edges of their wings. April brings us blue butterfly days, to borrow a phrase from Robert Frost's poem of springtime, "Blue-Butterfly Day." Small blue butterflies, aptly named spring azures (Celastrina ladon), flutter close to the ground in Westborough's woods from mid-April to mid-May and into June. These tiny bits of twinkling blue have a wingspan of 1-1/4 inch or less. Spring azures catch our attention as they fly and flash blue. Their wings are blue on top, so the blue shows as they flutter. Underneath, their wings are gray with dark squiggly spots. When spring azures land on low vegetation or on the ground, they usually fold their wings together, showing the camouflaging gray undersides. Keep an eye out for them in shrubby areas along wooded trails and the edges of woods. Their flight is quick and erratic, and often near the ground. You can enjoy watching these small butterflies with the naked eye. For a closer look that won't scare away the butterfly, or for butterfly-watching in general, close-focusing binoculars are handy. They can focus within 6 or 8 feet, so you can look through them at something right at your feet. A close-focusing macroscope, which has only one barrel (like a telescope) and focuses as close as 18 inches, is also good for close viewing. The lives of adult spring azure butterflies are as brief as our New England spring seems to us. They're measured in days. Spring azures have spent the winter in the chrysalis stage, inside a hard covering that protects and disguises them as they rest and transform from caterpillar into butterfly. They emerge in the spring to mate, lay eggs, and die. The best time of day to see spring azures is from mid-afternoon until dusk. Much of their activity centers around courtship. The males patrol an area, flying back and forth as they look for females. Sometimes they perch and watch. If you stand and watch a spring azure, it may seem to flutter away, but in a short while it will probably come back to the same area. April is famous for its mud, and that's good for spring azures. They visit mud puddles for moisture and minerals needed for reproduction. You might even see several gathered at the edge of the same mud puddle. Female spring azures live a few days - just long enough to mate on the first day and lay eggs on the next. They lay pale green eggs one at a time on flower buds of the particular plants that will be suitable food for the caterpillars. As with other butterflies, only certain plants will do. Spring azures choose shrubs such as blueberries (Vaccinium), viburnums (Viburnum), and dogwoods (Cornus), among others. These shrubs are common in our woods and bloom in late spring, in time for their flowers to feed spring azure caterpillars. The caterpillars can be green, brown, pink, or white, depending on their food. As they eat, they grow, shedding their skins four times as they get larger. Spring azure caterpillars get a little help in the drama of survival from ants. The late-stage caterpillars have a "honey gland" that makes a sweet liquid that attracts ants. The ants tend and protect the caterpillars from wasps and flies. The caterpillars keep the ants interested by offering the sweet liquid from time to time. We're used to thinking of caterpillars as bird food, but we don't often think of the many threats they face from other insects. For example, parasitic wasps lay eggs inside caterpillars. When the eggs hatch, the unfortunate caterpillars get eaten from the inside. Caterpillars that are tended by ants call for help when another insect threatens them. They release a chemical that is similar to one that ants use as an alarm signal. This alarm sends the ants into a protective frenzy, and they will attack and kill the threatening insect. Spring azures aren't the only butterflies whose caterpillars are tended by ants. The relationship between ants and caterpillars is mutually beneficial. From this perspective, it's not surprising that half of the butterflies in the large family that includes the spring azure have caterpillars tended by ants. Once the spring azure caterpillars are large enough – a little more than half an inch long – they go into their next life stage. They find a protected place, such as a crack in bark or a pile of leaf litter, and form a hardened chrysalis around themselves. Inside they rest for much of the summer and fall and then overwinter. During this time their organs dissolve and reorganize, creating the spring azure butterflies that emerge in spring. Spring azures are the first blue butterflies of spring, but they aren't the only blues that will be around to appreciate. We can typically begin to see Eastern tailed-blues (Everes comyntas) in mid-May. They go through a few generations during the summer, and we tend to notice them especially in July and early September. 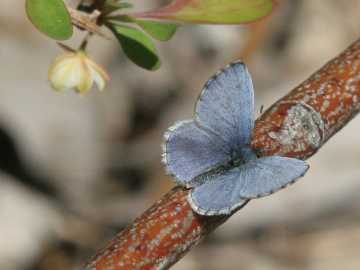 As its name suggests, this blue butterfly has a tail, and a couple of small orange spots near the tail. The silvery blue (Glaucopsyche lygdamus) flies from late May to late June. It's blue on top and has a band of large dark spots on the gray undersides of its wings. Its caterpillars are also tended by ants. Throughout the summer, you can see summer azures (Celastrina neglecta or Celastrina ladon neglecta). They look similar to spring azures but are usually lighter blue or nearly white. Researchers are still investigating their exact relationship to spring azures. Our native blue butterflies are small, but if they capture your fancy, you might enjoy a large rainforest butterfly, the blue morpho (Morpho peleides). Consider visiting an indoor butterfly garden with tropical butterflies, at Boston's Museum of Science or the Butterfly Place, Westford, MA. How long do blue butterfly days last? We can celebrate their beginning this month with the spring azures. Perhaps they will last until fall. Westborough resident Clay Borglund sent this sad report: "On Friday 3/23, I was driving by the tennis club on Oak St, when I saw the white squirrel dead in the road, having been hit by a car. I picked it up and brought it to the Fish and Wildlife headquarters, where they said it would probably be mounted."